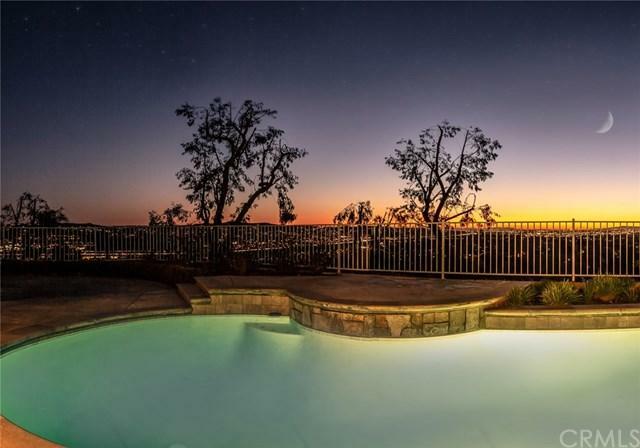 Set atop the hills of Yorba Linda, this cul-de-sac home boasts a truly unfathomable view that sweeps from the skyline of Downtown Los Angeles, across Orange County and out to Catalina Island. Step inside this single story home decorated in designer neutral colors and you will appreciate the updated kitchen and baths. Inside the master bedroom suite you can fall asleep to the twinkling of city lights or escape to your resort worthy ensuite master bathroom with dual vanities, soaking tub, shower with seamless glass enclosure and walk-in closet. Step outside and enjoy the exceptional entertainers+GG yard that includes a saltwater pool with baja shelf, spa and large grassy lawn, producing citrus and even room for your own veggie garden. The generously sized pool deck offers the perfect spot to watch golden sunsets that fade into the Pacific Ocean and then Disneyland Fireworks, all while you wind down from the day+GGs activities. Prefer to go green? You will appreciate the water-friendly frontyard and a home that runs on solar! Enjoy outdoors? This hilltop home is walking distance to the Old Edison Trail that leads to over 90 miles of Chino Hills State Park trails+G-with endless walking, hiking and mountain biking opportunities! Easy access to local freeways and toll roads and set within highly ranked and sought after Yorba Linda Schools! Sold by Melinda Johnson of Freedom First Properties.